Participating and taking the parts of the Four Chaplains will be veterans from Seymour’s American Legion Post 10. Military honor guards from other local towns will also take part, along with Rev. Russell Lesiw of Seymour and Rev. Ken Smith, Pastor of First Baptist Church of Shelton. Rev. Lesiw now attends First Baptist Church of Shelton, and for twenty years has assisted with Post 10’s Four Chaplains events at locations around the Valley. Individuals who enjoy singing are invited to arrive at 1pm and rehearse with the event choir, which will be led by Pat Lesiw. A free reception will follow. Parking is available on site. The church building also has an elevator and ramps for visitors using wheelchairs. To learn more about the Four Chaplains and SS Dorchester, see www.FourChaplains.org, the website of the Four Chaplains Memorial Foundation, and on Facebook, “The Chapel of the Four Chaplains and the Four Chaplains Memorial Foundation” page (type @fourchaplains.org). Also see YouTube.com, where several videos are posted. These include the short video Four Chaplains 2019, by Wreaths across America. 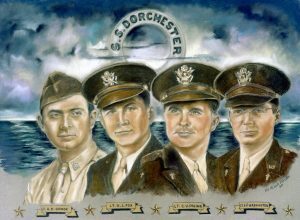 Note: The Four Chaplains images have been used courtesy of the Four Chaplains Memorial Foundation.